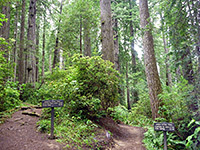 Prairie Creek Redwoods State Park has around 60 miles of trails, giving access to varied landscapes including dense redwood forest, high ridges covered by fir trees, deep ravines, long grass meadows and Pacific Ocean beaches. Pick of the shorter walks are along the Brown Creek, Cathedral Trees, Circle, Fern Canyon, Ossagon, Prairie Creek and Rhododendron (south section) trails, while the best extended hike is the loop along the James Irvine and Miners Ridge trails. Elevation changes are generally minor, and the interconnecting paths allow for many loop hikes. Most routes start along the Newton B Drury Scenic Parkway, the main road through the center of the park. 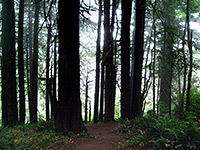 The Prairie Creek Redwoods map shows the location of each trail. See also hikes in Redwood National Park. Ah-Pah Trail 0.3 40 This short interpretive trail follows the first section of an old logging road through the redwood forest, a track since removed and the surroundings changed back to a natural condition. Notices along the way illustrate the restorative process. Boat Creek Trail 1.7 400 Branching off the Friendship Ridge Trail near its northern end, the Boat Creek Trail crosses densely-wooded hills bearing redwoods and spruce, running alongside a steep ravine south towards the Pacific. The official trail ends a little way before the ocean though it appears possible to walk all the way along the ravine, and link with the Coastal Trail near Fern Canyon. Brown Creek Trail 1.3 280 From a trailhead on the east side of the scenic drive, this path follows the cool, well-watered ravine of Brown Creek where the giant redwoods grow particularly close together, before climbing gradually into a slightly drier environment of mixed fir and redwoods, up to a junction with the Rhododendron Trail. A good 3.4 mile loop hike can be made by walking south along this route for a mile then returning to the start point via the lesser-used South Fork Trail. Butler Creek Trail 1.8 800 Linking the West Ridge Trail near its northern end with the Coastal Trail near Ossagon Creek, the Butler Creek route runs for while along a high ridge bearing many large redwoods then descends steeply through spruce forest and coastal woodland, into a cool ravine and out to the wide sands bordering the Pacific Ocean. Carruthers Cove Trail 0.8 560 The northernmost trail in the state park starts a mile from the south end of the Coastal Drive; it descends steeply, through a small band of redwoods and into more diverse forest of red alder, sitka spruce and salmonberry. The path then enters an overgrown ravine at the lower end of Johnson Creek and emerges to a sandy section of Pacific Ocean beach (Carruthers Cove), next to a shallow lagoon and a large protruding cliff face. From here the Coastal Trail heads south, linking with the road to Fern Canyon. 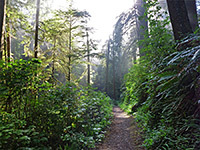 Cathedral Trees Trail 1.4 50 The easy, mostly level Cathedral Trees Trail runs between the north edge of Elk Prairie and the Big Tree on the Circle Trail, en route passing countless huge redwoods, mixed with the usual dense array of ferns, moss, bushes and smaller trees. On the far side of the highway, the lower section of the Prairie Creek Trail allows hikers to make a 2.6 round trip, perhaps the best loop hike in the park for families with children. Clintonia Trail 1.0 200 The short Clintonia Trail connects the Miners Ridge and James Irvine Trails, crossing high ground covered mostly by spruce trees, though with some large redwoods towards the north end, around Home Creek. If starting at the visitor center, the trail can be used as the western section of an excellent 7.3 mile loop. Circle Trail 0.3 (loop) level The most popular short path in the park loops around large redwoods alongside the scenic drive, starting a mile north of the visitor center. Amongst the redwoods on display is the Big Tree, one of the tallest in the area. Coastal Trail 4.8 level Over 70 miles of the Coastal Trail pass through the redwood parks; the Prairie Creek section links the Carruthers Cove Trail with the north end of Davison Road near Fern Canyon - along the edge of the wide, windswept sands of Gold Bluffs Beach, which are home to a large herd of elk. Some parts of the trail are through open woodland, close to but out of sight of the ocean. CREA Trail 1.4 650 The lightly traveled CREA (California Real Estate Association) Trail links the north end of the Rhododendron Trail with US 101, crossing wooded hillsides high above Brown Creek and climbing to a rounded summit at 1,400 feet. Elk Prairie Trail 2.8 (loop) 80 This loop path circles all around the edge of the forest surrounding Elk Prairie and so offers good opportunities to see the resident elk, as well as many large redwoods. 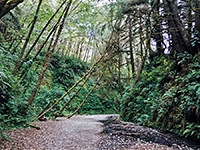 Fern Canyon Trail 0.7 (loop) 160 Perhaps the most unusual trail in Prairie Creek Redwoods State Park is the short loop around beautiful Fern Canyon, a sheer-sided, flat-floored ravine whose 30 foot walls are densely covered with dark green ferns. The path starts on Gold Bluffs Beach, accessed by the unpaved Davison Road (not for vehicles over 24 feet). Foothill Trail 2.2 140 This quite popular path through the redwood forest parallels the main road on the east side a little way up into the hills, at times running quite close to the highway and so subject to traffic noise, though in other places veering further eastwards away from the road in order to cross several steep ravines. Friendship Ridge Trail 3 600 Elk, solitude, old growth redwoods and far reaching ocean views are the main attractions of the Friendship Ridge Trail, a moderately strenuous route that starts in the south at a junction with the James Irvine Trail near Fern Canyon, and ends in the north at an intersection with the West Ridge Trail; all three paths can be used to form a 12.5 mile loop, perhaps the second best all-day hike in the state park (after the Miners Ridge/James Irvine loop). Hope Creek and Ten Taypo Trails 4 (loop) 450 On the east side of the scenic drive, these two trails form a 4 mile circuit through old growth redwood forest, traversing the fern-covered hillsides above two small creeks. The upper part of the route is through more traditional woodland, where the two paths are linked by a short section of old logging road, also accessible from US 101. James Irvine Trail 5.1 250 James Irvine is amongst the premier trails in the park, encountering some of the largest trees and the densest forest. 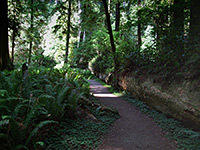 The eastern trailhead is by the visitor center along the Drury Parkway, from where the path climbs gently along the wide valley of Godwood Creek, crosses a low saddle then descends the slightly narrower ravine formed by Home Creek, passing Fern Canyon and meeting the Coastal Trail along Gold Bluffs Beach. Walking south for 1.2 miles reaches the west end of the Miners Ridge Trail, which can be used to form an 11.5 mile loop - perhaps the best all-day hike in the area. Little Creek Trail 0.3 100 One of the easiest trails in the state park follows a little stream a short distance east into the dense forest, passing many ancient fallen redwoods as well as numerous healthy living trees. Miners Ridge Trail 3.6 450 Forking off the James Irvine Trail near its eastern end, the Miners Ridge route climbs to a narrow ridge and drops down quite steeply towards Squashan Creek, entering a particularly cool, dark and overgrown section of the redwood forest. The path - established by gold miners in the 1880s - follows the creek downstream and exits the trees next to the campground at Gold Bluffs Beach. Together with the James Irvine Trail, the Coastal or Clintonia Trails enable a loop hike, of 11.7 or 7.3 miles respectively. Moorman Pond Trail 0.5 200 A redwood grove dedicated to Charles H Moorman (a Sixth Circuit judge from Kentucky) and his wife Lily is the destination of the little-traveled Moorman Pond Trail, which follows a small creek, climbing gradually to the memorial trees. Ossagon Trail 1.8 730 Starting near the north end of the scenic drive, the Ossagon Trail (most of which runs along a former logging track) follows a shallow, redwood-studded ravine then descends quite steeply into the valley of Ossagon Creek, winding down the hillsides and meeting the Coastal Trail by the ocean, next to a primitive campsite (now closed). The trail is one of few in the park that is also open to bicycles. The adjacent beach has several points of interest including pools, marshland and isolated rocks. Prairie Creek Trail 4 350 This trail runs most of the way along Prairie Creek, generally on the west side a short distance above the water, though crossing the stream several times and spending a little time on the east side. It can be accessed from several places along the scenic drive, and links with three paths that climb the steep hills to the west, up to the high ridge at the center of the park. Some sections are within hearing distance of the road but most are quiet and peaceful. All the route encounters very dense, old growth forest of redwoods and maples. Rhododendron Trail 6.3 620 Few people hike the full length of the 6 mile Rhododendron Trail, though two connecting paths (the Brown Creek and South Fork Trails) allow various loop hikes including either the northern or southern sections (this latter seems to be the most scenic). The trail is named on account of the numerous rhododendrons that produce red and pink flowers in spring and summer, making the predominantly green landscape especially colorful and photogenic. The south trailhead is reached by a short walk along the Cathedral Trees Trail while the north end is half way along the scenic drive. South Fork Trail 1.0 560 Like the Brown Creek Trail just to the north, the South Fork Trail links the park road with the high elevation Rhododendron Trail, running mostly along a wooded ridge covered by ancient old growth redwoods, and gaining height quite steeply. The three trails can be used to form a 3.4 mile loop. West Ridge Trail 7.0 640 The longest trail in the state park begins at Elk Prairie in the south and climbs quite steeply to the top of the thickly forested ridge separating Prairie Creek valley from the smaller ravines bordering the Pacific Ocean. It follows the ridge northwards, staying fairly level for several miles before a slight descent to junctions with the Butler Creek and Friendship Ridge routes. Other paths link with the main road, so various shorter loop hikes are possible.